And then, as I slowly leave the room and quietly close the door, I realize that the answers to those questions are contingent on one person. Me. Their father. Now that’s not to say that my wife doesn’t have a hand in this. If I didn’t have her by my side the entire house would be up for grabs. But studies clearly show the necessity of a father, or at least a father figure, in the life of children. Those that come from places with an absent father or regular male role model in their lives are more likely to be in jail, more likely to be sexually promiscuous and more likely to be prone to a multitude of other problems. As a Catholic father, I have even greater demands on me, and these expectations are something I must fulfill, particularly because I vowed to follow through at each of my children’s baptisms. Now I’m far from being the father of the year (I pray that our Lord will allow me to raise my children well everyday), but with Father’s Day coming up, I’ve been thinking about how fathers, and Catholic fathers in particular, need to be bold. What does it mean to be a good Catholic father in this day and age? 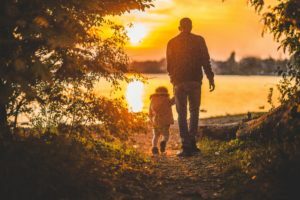 I only have about four years’ experience of being a father, so this may not be much that I’ve picked up, but here are four ways we as fathers can really live out our vocation in a heroic way. Because that’s what we’re called to do: to give a heroic witness to our children. 1. Pray with your children daily and let them see you pray. We as fathers (along with our wives) are our children’s primary instructors in the Faith. Not the religious education teacher. Not our parish’s pastor. Not our own mothers. We are. Studies have shown that when a father does not practice his faith in front of his children, there is only a very small chance that the children will themselves be religious as adults. Your role as a father matters in the eternal salvation of your child. Can’t be any more blunt than that. You as a father need to pray with your kids, principally during the Mass. Let them see you making the Sign of the Cross after dipping your hand in the holy water font, and do it slowly. Let them see you genuflect before our Lord as you enter and exit church, and ensure that they do so when they are of age (my 25-month old son can do it, so start them young). Let them see you strike your breast with sorrow for your sins at the Penitential Rite. Let them see you bow your head in reverence at the elevation of the Eucharist. Also, pray before meals, and ensure that you, or your wife (or both of you) are praying with your kids before bedtime. Kids are great at memorization. Young children can easily memorize the Our Father, Hail Mary, and a few other prayers if you pray it with them each day. “You shall therefore lay up these words of mine in your heart and in your soul… And you shall teach them to your children, talking of them when you are sitting in your house, and when you are walking by the way, and when you lie down, and when you rise” (Deuteronomy 11:18-19). It’s always a good time to talk to our children about our Lord Jesus. “Love for his wife as mother of their children and love for the children themselves are for the man the natural way of understanding and fulfilling his own fatherhood… In revealing and in reliving on earth the very fatherhood of God, a man is called upon to ensure the harmonious and united development of all the members of the family: he will perform this task by exercising generous responsibility for the life conceived under the heart of the mother, by a more solicitous commitment to education, a task he shares with his wife, by work which is never a cause of division in the family but promotes its unity and stability, and by means of the witness he gives of an adult Christian life which effectively introduces the children into the living experience of Christ and the Church” (FC 25). Our children need to see that we love their mother. This is why we always need to put our wife at number one (well, two, after God of course). A lot of people in our culture flip flop that and put their kids before their spouse. We as Catholic fathers can’t afford to do that. Marriage is permanent. We know that. If our relationship isn’t good with our wife, it will have detrimental effects on our children. We have to keep harmony in our family, and if our kids see us being kind to their mother, they will be witnessing true manhood. Don’t fight in front of your kids, and always pray to St. Joseph that you may be a good husband so that you in turn may be a good father. You have to tell your kids this. Even your sons. We all know that our daughters are the apples of our eyes, and we are affectionate with them. But our sons need that, too. Whether you have all boys, all girls, or a mix of both, you have to let your kids know you love them. You can say that with those three simple words. Or get down on the ground and play with them. Show interest in their activities, their creations, their sports. Show them by teaching them about your greatest love, Jesus Christ. We might think that our wives are the sole providers of “TLC.”, but that couldn’t be any farther from the truth. We as fathers might of course be a bit rougher with our kids, and take more chances with them than our wives would want us to, but we also need to be tender with them, and they need to see that too. St. John Paul II also warns against “the phenomenon of ‘machismo’”. Don’t be like the guys that you see in Hollywood or on TV. That isn’t authentic manhood. Kids need their dads to provide both toughness and tenderness. It’s not an either/or, but instead it’s a both/and. Now I know I already said that fathers need to pray, but this deserves its own point. Numerous saints have attested to the power of the Rosary. St. Padre Pio continuously prayed the Rosary, often calling it his “weapon”. And that it is, as the Rosary is an excellent tool for spiritual combat. This means it’s good to get your kids using it early. When I was young, my father always led our family in the Rosary. It’s not a prayer for old women. It’s a prayer for all Catholics, especially for dads. Here’s something a lot of people might not know: one can attain a plenary indulgence for saying the Rosary with one’s family. This is something one can do daily. As I said, my dad (and mother) often said the Rosary with me and my three siblings. And on top of that, it was not uncommon in my large, extended, Italian family for over 60 people at once to recite the Rosary at family birthday parties. My father, grandfather, uncles and male cousins all joined in. It was a beautiful witness. Now, did things get crazy sometimes with kids running around, either at family parties or at home with just my immediate family? Yes. And things even get really crazy now when we try to say the Rosary with two kids under the age of four. But it’s something we need to do. If you must, just say one decade of the Rosary. But I challenge you to start saying the entire five decade Rosary with your kids from the time they learn the Hail Mary. Let our Catholic faith be front and center with your family. Of course, these are only a few ways we can go about being better dads. But at least it’s a start. We have so many great examples among the saints, so we must look to them as we endeavor to be good and loving fathers to our children. There’s only one main reason why we’re doing all of this, after all. It’s so that our entire family may be united with our Lord together in heaven one day. Do you want your child to be in heaven at the end of their earthly life? You as a father need to lead them there. What are some other ways we can be better dads, or ways we can help our own dads or husbands in their vocation as fathers? Let us know in the comments below.